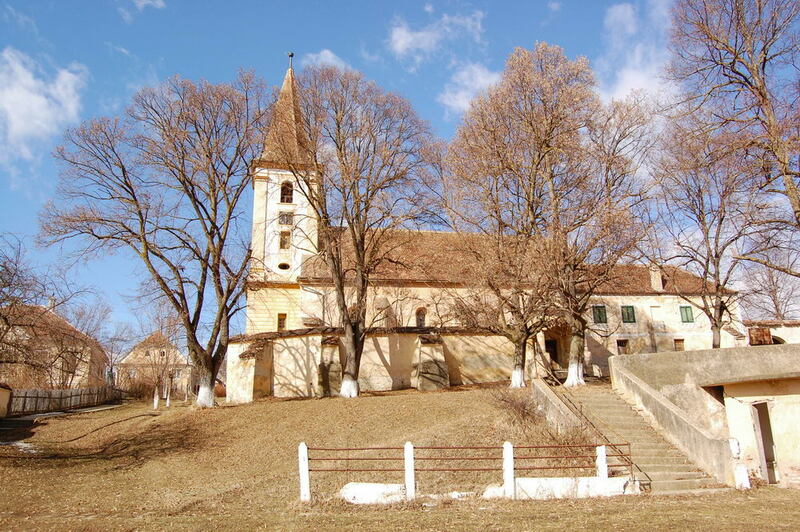 The fortified church of Marpod lies northeast of Sibiu – in the Harbach valley it stands out cautiously and well hidden behind trees and scrub. The Romanesque basilica, of which only a few elements remain in the present building, dates back to the 13th century. 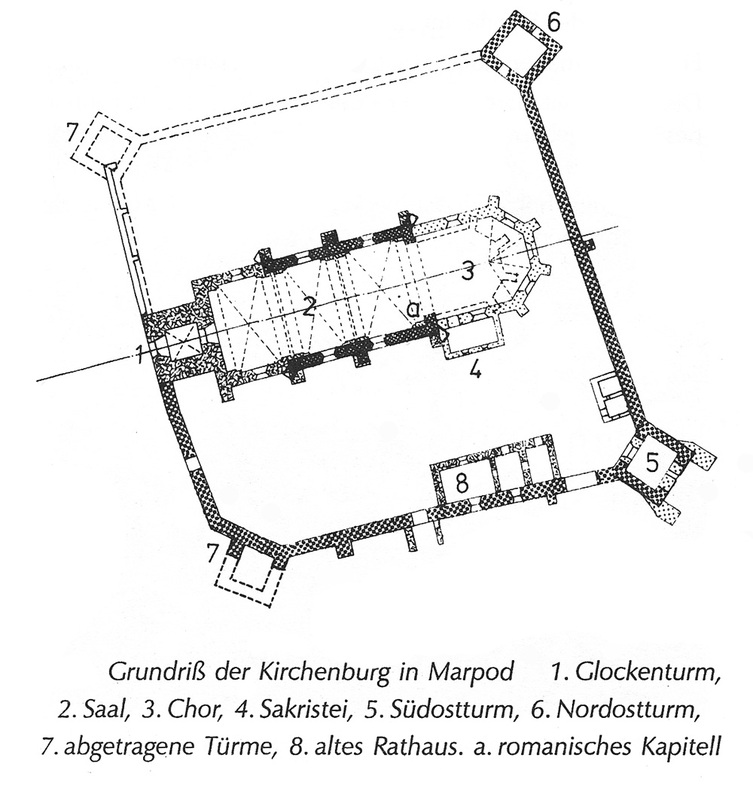 Around 1500 the fortified church was built. It was given its present appearance at the end of the 18th century. In the seventies of the last century there had been securing work using concrete. 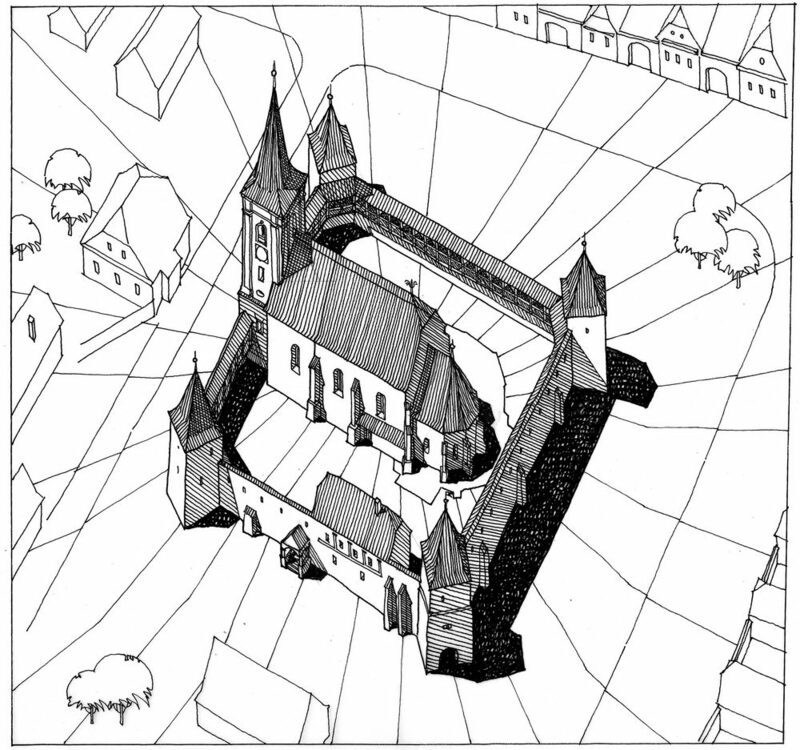 Now something is to be done again for the fortified church – this time however without concrete and in the sense of a preserving monument preservation. The Fortified Churches Foundation and the Emigrated Saxon Hometown Community of Marpod are currently working on the first steps. Two meetings have already taken place last year between Sebastian Bethge, the Foundation’s Commissioner for the Protection of Monuments, Michael Robert Gabel, Chairman of the HOG, and Wilhelm Schneider, Curator of Marpod. The results of these meetings and future investigations will be summarized into an initial inventory. Nevertheless, it is already evident: The fortified church is not in good condition, plants and trees are growing around the walls, the terrain is overgrown, the roof has small holes. Bethge is currently preparing a building report which should be available in spring. Based on this report an initial maintenance measure will be carried out at the church. In addition to step two, the emergency measure, and step three, the construction project, this care measure is the first step that the Fortified Churches Foundation is taking to preserve a building for the future. In the case of Marpod, the first steps towards the project of the care measure can be implemented with the envisaged sum, which will be provided in particular by the Hometown Community. As soon as the building report is ready, an appeal for donations for further measures is possible. In addition to this first step, which also includes a clean-up, the cracks in the walls of the Fortified Church have to be examined. Further steps for repair must follow. The semi-detached ring wall is still in good condition, but the tower in the south-east collapsed 10 years ago. A jewel of this fortified church is the completely preserved two-storey castle keeper’s house, which could also be used for tourist purposes in the future. In the immediate vicinity between Marpod and Kirchberg there is another tourist attraction: in Ilimbav/Eulenbach there is an organic farm on which is kept the rare breed of Mangalitza pigs. The Mangalitza pig has been bred in Transylvania for about 150 years. The meat products of this breed should be particularly rich in omega-3 fatty acids. The Biofarm regularly offers tastings of its products. Anyone visiting the Marpod fortified church can continue along the culinary trails of Transylvania along the historic trails. Mr. Schneider, House No. 14, on +40 269 584 169. Which painter created the central picture of the triptych in Marpod? After our draw the winner will receive a Fortified-Churches-Memory. Please send your submissions by 31 May to ab@kirchenburgen.org. Congratulations! The winner of the riddle of the “Focus May 2018” is Mr. Martin Eichler from Munich. The painter of the central picture of the altar in Marpod is Hans Hermann.